“I chose to go to Ghana on an impulse, and it was the best choice I’ve ever made,” says William. Since his first trip to the nation, he has been back several times, even living in the small village of Akonfudi for six months. It was the warm and friendly nature of Ghanaians that inspired William to branch out into fashion. “When I was doing a trend analysis for school, I saw that African prints were becoming popular in Europe. I decided to connect this trend with the Ghanaian tailors in my village and start an African fashion label.” This is how the online clothing store, Akwan2fo Fashion, was born. 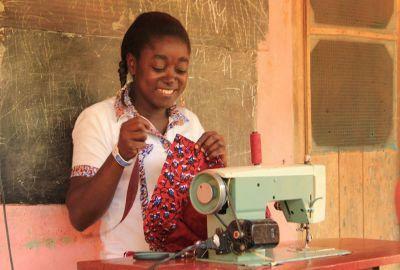 Victoria Oduro, a tailor in Ghana, makes clothing locally for the European and USA markets. Akwan2fo Fashion officially launched in June last year. All the clothes are designed in the Netherlands and made by local Ghanaian tailors, forming a partnership that allows both sides to develop and grow together. Committed to transparency, each item comes with a label telling the story of the tailor who made it. 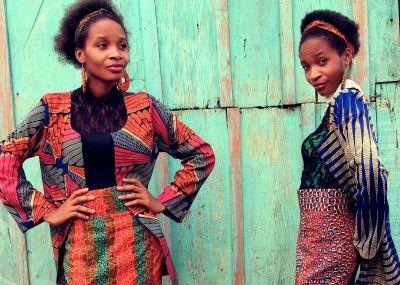 “Many people still see Africa as a poor continent; we want to express another side of Africa in our clothes. For us, Africa is dynamic, cheerful, friendly and full of opportunities.” The bright colours and loud patterns of William’s clothes reflect this philosophy. With unexpected success in markets like the USA and Spain, the fashion label is hoping to expand its international reach in the future. In February, one year after the project began, William started working on the summer 2015 collection. The success of Akwan2Fo Fashion is testament to the connections and opportunities that volunteers can make during an overseas placement. Follow Akwan2fo Fashion’s progress on Facebook or Twitter. Read more about Projects Abroad Ghana here.